MPWD Student Mentoring a "Perfect Match"
During 2016/2017, the MPWD participated in Carlmont High School’s Biotech Institute (BTI) program in furtherance of its community outreach and public education. General Manager Tammy Rudock served as a leadership mentor to Hunter Crawford-Shelmadine, a Carlmont High School Junior. Hunter’s goal is to attend college in Southern California and study marine biology. Tammy shared tours of MPWD facilities and operations with Hunter during the year, including introductions at a business meeting of the Harbor Industrial Association and the MPWD Board of Directors in early 2017. “It was a perfect match,” exclaimed Tammy that the MPWD was partnered with Hunter because of her interest in a water-related career. Tammy and Hunter occasionally met over breakfast for ongoing support, mentoring, and progress reporting. Photo above: Hunter takes a guided tour of the Exbourne Tank Site during cleaning and maintenance with Operations Supervisor Mike Anderson, Lead Operator Rick Bisio, Water System Operator Ron Leithner, and General Manager Tammy Rudock. “Hunter’s energy is limitless and she is an extremely bright and productive young person,” added Tammy. 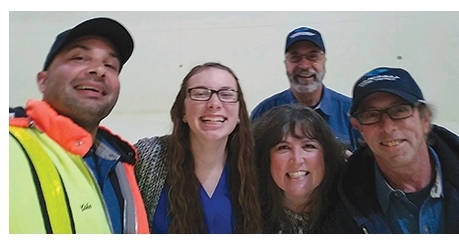 Hunter replied that she “really enjoyed” getting to know more about local water supply systems, the California water industry, and potential opportunities for her as a future marine biologist. The Mid-Peninsula Water District has been active in community outreach for more than 60 years and continues this tradition today with school programs, mentoring, and hands-on workshops. For more more information or opportunities, please contact Administrative Specialist Jeanette Kalabolas at JeanetteK@MidPeninsulaWater.org or 650-591-8941.